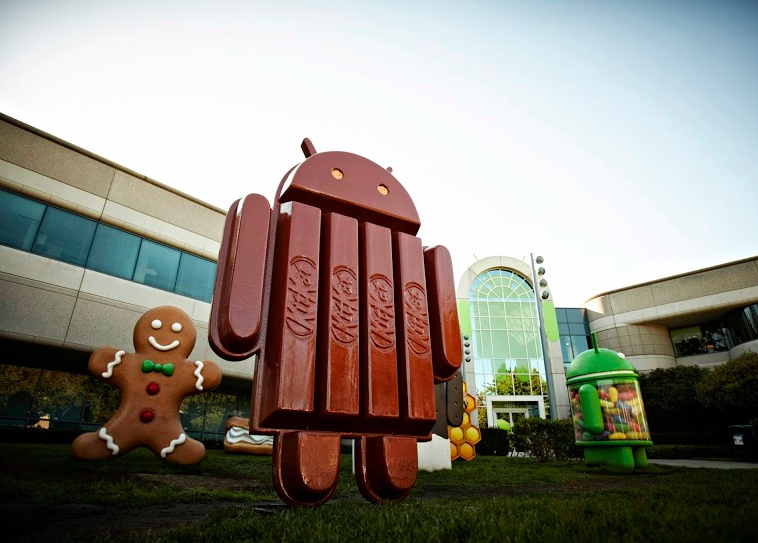 Whoa…today is certainly shaping up to be a very interesting news day as Google unveils Android 4.4 KitKat. Yup, that’s KitKat just like the candy bar and it seems Google won’t have any trademark issues as the company has a promotion in place where you can win Nexus 7 devices or Google Play credits by purchasing specially market Kit Kat candy bars in stores near you. Android chief Sundar Pichai posted a picture of the now erected statue on Google’s headquarter lawn of the new KitKat Android 4.4 character. Needless to say, KitKat is coming and soon. With the news that the Nexus 4 is selling out and a possible Nexus 5 announcement next month it certainly sounds like the time is right for Google to bring the next version of Android to the world. Stay tuned for more details as this exciting story continues to develop. I can’t wait for Android 4.5 Reese’s Peanut Butter Cup. Glad I wasn’t the only one that noticed that. They could do it for P, leaving out Reese’s. True that, but that would still be too far off. I learned the alphabet when I was 3. I’d love to teach you. Aawww, you’re suppose to sing along! Oh well, I’ll have a KitKat break anyways. Guess people that dont like the update will start saying like KitKats, Android 4.4 is junk, sugary food that isnt good for you…and “Gimme a break’ with the lack of innovation in the new Android OS. “KitKat” is a trademark. There’s probably something copyrighted involving that candy bar – the text on the packaging etc, but it’s trademark issues Google would need to be concerned with if they hadn’t talked to Nestlé up front, not copyright issues. No, I know they’ve spoken to Nestle – David’s said as much in the write up. I was just being pedantic about what was at issue – David said copyrights, but it’s almost certainly trademarks. Fair point, I’ll change the language. They have talked and gotten permission from the manufacturers as long as they didnt use the hyphen…So its KITKAT not KIT-KAT. And unless 4.4. is a major fail with tons of glitches, the publicity they will get is incredible. Apparently it is distributed by Hershey in the US but Nestle in the rest of the world. The stories I read included quotes from Hershey saying they were approached 6-9 months ago with this…But I would think theyd need international rights (or permission). I just wonder if people in other countries know what Kit Kat is. Plus look at the photo above itself that will go all over the world today. Its clearly a Kit Kat bar. They are both marketing on this. 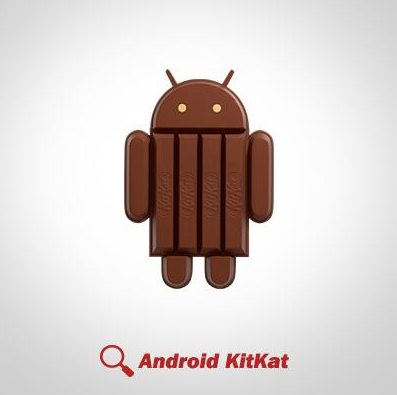 Nestle is releasing Kitkat bars around the world with the Android logo on it. Like that much better than Key Lime Pie. I’m buying me a Kit Kat later when I go to the store. MMMMmmmmm….Kit Kats….. The Kit Kat owners are a European Company – Nestle, stock listed in Europe. It is produced in the US under a license fee to Nestle. But through Hershey, to finish the last statement. I suppose Google was tired of people assuming what they’d name things and wanted to puill something out of left field. Everyone just assumed Key Lime Pie because it made sense, but hey good on Google for surprising us. Don’t know why you thought desserts and candies. They’ve named their OS before on stuff that is not a dessert nor a candy. They’ve always use “Sweets” – Cupcake, Donut, Eclair, Frozen Yogurt, Gingerbread, Honeycomb, Ice Cream Sandwich, Jelly Bean… Some of them are desserts and 1 is considered a candy. But all of them are sweets. Google deliberately led people to believe that the name would be Key Lime Pie. There are a number of articles across the web that went into greater detail about how the KitKat name came about, and basically, KLP started with Google, and even after Google decided to go with the KitKat name many months ago, they kept using KLP. There were multiple instances where Google used images of key lime pies during I/O, and they used that name in communications with OEMs. So no, Google wasn’t “tired of” people using that name, because they were very much encouraging it. And it proved an effective decoy that allowed yesterday’s announcement to catch everyone by surprise. HA to all you bloggers that been calling it Key Lime Pie all this time. Didn’t even think to use KitKat…thought there would be some issues there with legal stuff. extremely popular in Europe and Asia actually. iIf you ask me i think Google makes some of the best Decisions out of any tech Giant in most the World, both in software, hardware, even their naming system is unique. They already Offer Tablets and Smartphones that are equal to or even better in many cases then most Smartphones out today , and for half the price unlocked off contract, and with instant updates and guaranteed device support for years and years to come. Also with “Cheaper”(for lack of a better term) smartphones and tablets becoming popular and the Wireless Market moving more and more towards Prepaid like the rest of the World, google is already many years ahead of the Game. you haven’t even seen it yet? If it was only Minor it would still be Called Jellybean? This is a huge promotion for Android too. Got a quick question. I didn’t update to 4.3 on my Nexus 4 because I read about a lot of problems it was causing. I keep clearing the notification that a system update has downloaded and is ready to install. When 4.4 rolls out is 4.3 going to install on my phone or will 4.4 download and override it? Or is there a way to get this 4.3 download off of my phone? I don’t know where it is located. Thanks. They may require the 4.3, or it may jump over to 4.4, it just depends on whether Google provides the direct update form 4.2.2. Ultimately, if it’s a direct from 4.2.2 to 4.4, it will include everything from 4.3, and probably any bug fixes to what 4.3 was causing. On the second question, not really Unless you root. In connection to the 2nd question, and yes it works for the N4 the same as the GNex. If it was going to be a mInor update it would still be called Jellybean But obviously it’s not going to be minor, but major. I for one trust Google, I think they make Great Choices in most aspects and situations regarding their products and software, better than apple and samsung at least. So this means Key lime is out? You got it. It was speculation and a place holder to begin with, though I believe it started internally by employees first. Maybe v5 will be Lollipop or Ladyfingers instead of Key Lime. HHhhhmmmmm. I think this is a bold move by both companies, and there’s no way Apple would do this kind of move. Personally, I’m not a fan of Nestle but that doesn’t mean I won’t upgrade when KK comes out in 2155 for my Note 2. Lemonheads would be nice; love them! Lollipop seems the most likely, but that’s probably a year or more away. Omg I LOVE KIT KATS! I need to have that android figure. I need to track down a box of Android Kit Kats. Anyone know how long a Kit Kat lasts? Expiration date? Or I can just keep it lying around for decades and it’ll be fine. I see Android already has emoji look alikes I bet they unveil them on this update. I can see iPhone emojis as Android guys on my S3 so I know they’ve been experimenting with it. It’s not a look alike. Emoji is part of Unicode Standard, it is not owned by Apple. Apple was just the first domestic manufacturer to adopt them. Did Google manage to steal Apple’s thunder with today’s announcement of Kit Kat? I wonder if Google planned this all along? If so, well done … The blogs seem to be talking more about Android KitKat and the possible Nexus 5 than they are about the Sept. 10. Apple event. That’s partially due to far more to talk about with the Google news. Apple’s is just an event invitation, but Google released a whole bunch of news inside of one small announcement. Ummm so what does this mean for those of us who are stuck on 4.1.2? I am just saying I know that you can root your device etc etc…But this question is for those who don’t know how or want to do so…. Better get the $250 Nexus 4 while you still can? Or wait for the N5. Either way you wouldn’t have to wait for updates. Join us, we’ll have Kit Kats. Honestly, who cares what it is called. What does it do? What does this mean for those buying a new Note3 with that already outdated 4.3? I hope TmoUSA waits for new high end smartphones to be released with the latest version of Android. We know the long process for TmoUSA to work out all their kinks and reviews in the support system when a small update is actually released from Google. Nothing. 4.3 isn’t “outdated”. KitKat isn’t out yet, and won’t be for a while. When it does come out, Samsung may or may not choose to port it. If they do, you get the new features of KitKat. If they don’t, you continue to have what you bought. New apps will work under 4.3 thanks to Google Play Services. So you’ll be fine either way.